Epavlis apts, is just 20 metres away from the beach of Leptokaria, overlooking Thermaikos bay and the mountain of the twelve gods of ancient Greece, Olympus. Hospitable, impressive, elegant, a perfect choise for quality vacations. Aslo you have the opportunity for daily trips in different nearby places. 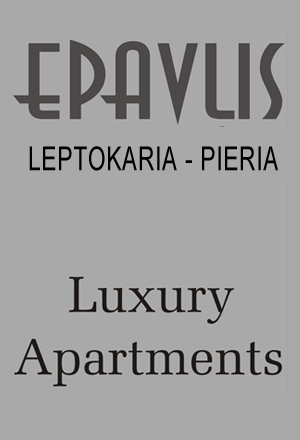 Epavlis apts is on Leptokaria of Pieria, 11km from Platamonas, 16km from ancient Dion, 25km from Katerini and 78km from "Macedonia' airport of Thessaloniki.